Strap yourself in for this gripping adventure anthology from DeepDark Designs. 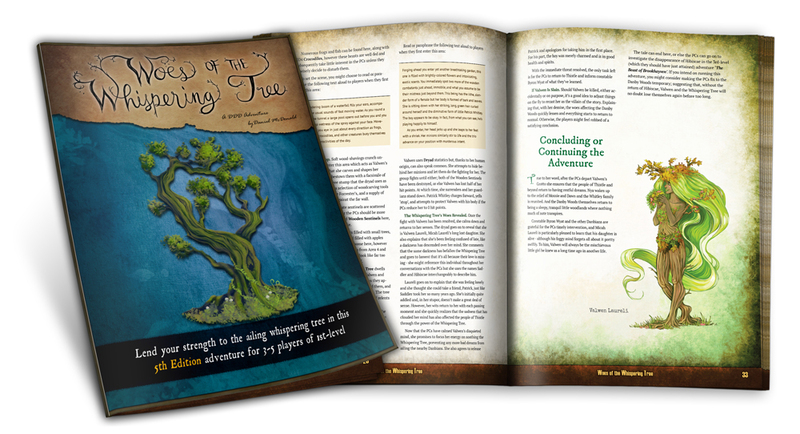 Weighing in at over 100-pages, Of Fey and Fear compiles three fantastic modules–Woes of the Whispering Tree, The Beast of Brookhayven, and Trouble at Grimhallow Manor–into one amazing collection for the very first time. If you missed them the first time around, now's your chance to dive in and explore Valwen's Grotto, battle the Raptocastificus, and survive the machinations of the manor-house as you race to flush the Soul Well. Far from your standard kobold-killing, rat-wrestling, or goblin-grappling (or even -garroting) fare, these surprising and unusual adventures favour the path less chosen, presenting much more unique and original ideas. Instead of playing it safe, these bold adventures bring the fantastical to the forefront, presenting surreal setups full of whimsy and wonder, and more reminiscent of fairytales and dreamscapes. Throughout these adventures, dreams and superstitions are as real and present dangers as anything the players are likely to face. Well, almost, the Swarm of Tools in Trouble at Grimhallow Manor can be surprisingly spicy for the careless, reckless, or uninitiated. Woes of the Whispering Tree. Venture into the Danby Woods and save the ailing Whispering Tree in this 1st-level adventure for 3-5 players. Discover the village of Thistle for yourself, meet the Danbians who live there, and investigate the cause of the mysterious bad dreams that have been plaguing the locals–just don't get too caught up in the hysteria or you might experience the terror that's been gripping them in the dead of night yourself. This introductory adventure should see a party all the way to 3rd-level by its conclusion. The Beast of Brookhayven. 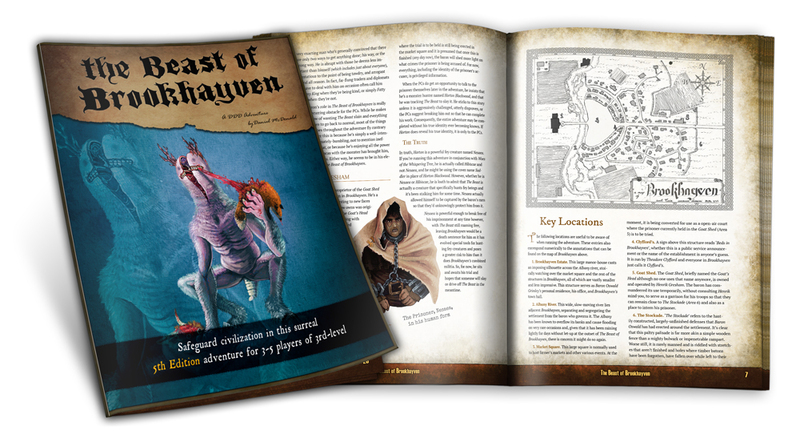 Discover Brookhayven, a town mired in superstition and fear, in this 3rd-level adventure for 3-5 players. Work to protect Brookhayven from the monster that purportedly hounds the town, stalking the surrounding farmsteads and striking from the shadows. Though, as great as the threat that comes from without may be, can it match the threat that comes from within the town, that of madness and hysteria? Face down both in this harrowing adventure that should see a party to 4th-level by its conclusion. Trouble at Grimhallow Manor. 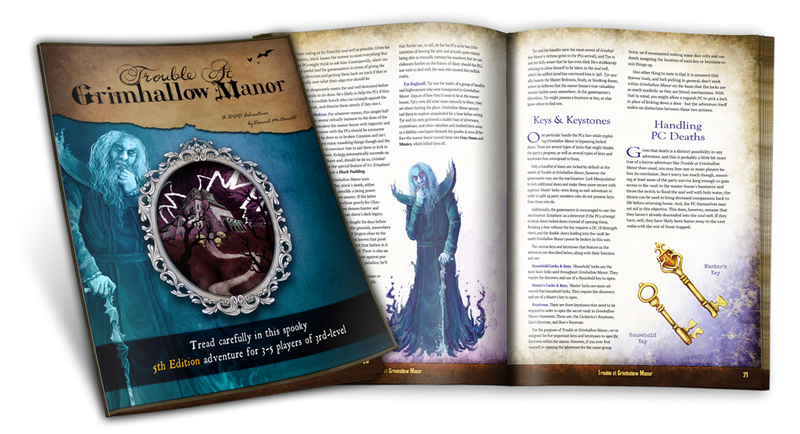 Awaken to discover your new surroundings as forces conspire to bring you to the steps of Gimhallow Manor in this dark and deadly horror adventure for 3-5 players of 1st-5th level. Introducing the Machination System, not only should no two playthroughts of Trouble at Grimhallow Manor ever feel truly the same, but the module can also be quickly, easily, and dynamically modified on the fly to accommodate groups of very different sizes and levels. Solve the mystery of the manor, uncover clues about its origin, and fight for freedom in this terrifying adventure wherein even death itself is only a temporary inconvenience. Grab your copy of Of Fey & Fey today and set course for adventures the likes of which are rarely seen. For even more Legandary Adventures from DeepDark Designs, look no further than Harrowing Heights.